We at Panter's hardwood floors feel that the first key to a lasting beautiful floor is that it is properly installed. Our installation crews have been specially trained to do just that. Our installers are craftsman that take pride in making your home's floors beautiful! 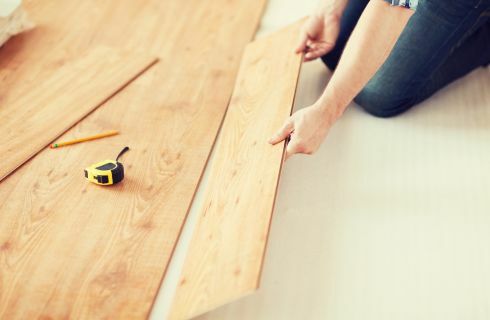 Whether you have us design a unique inlaid, custom finished hardwood floor, or simply choose a laminate floor we will make sure that all the necessary steps in subfloor preparation, layout and finishing is accomplished to do the job right. In this way, we can guarantee the installation right alongside the flooring manufacturer's warranty. Custom flush transitions to adjacent floors (whenever possible) instead of bulky T-moldings that collect dust and create tripping hazards. Care taken in assuring your home and furnishing are protected and kept as clean as possible during and after the installation of your floor. Personal instruction on how to care for and maintain your new floor. A guarantee that the floor is installed right at a reasonable price. We have been providing quality workmanship in the Inland Empire, Mountain, and Desert Communities since 1984. We will gladly meet with you in your home and discuss your project. We can provide ideas and options to help make your home's decor start with a beautiful foundation within your budget. A practical, lasting, but gorgeous new floor!